Almost everyone with a computer and Internet connection has come across the words “SMTP” and “POP.” Although we may not understand them, we see them from time to time, especially when using email. We usually dismiss this email jargon when, in fact, it is important that we know the definitions and distinctions between the two acronyms. What exactly is the difference between these two words? SMTP (Simple Mail Transfer Protocol) and POP (Post Office Protocol) are both standards used for emailing. Simply put, SMTP is used when receiving and sending emails (like your very own mailman who picks up and delivers your mail to different locations), while POP is the protocol used for the storing of emails (like your very own Post Office Box for mail storage). SMTP is the protocol in general use at the moment. SMTP has always been very reliable. Since its invention in the eighties, all emails have mostly been delivered to the receiver without encountering problems. This is why SMTP has become the standard for the transfer of the bulk of emails on the Internet. It is mainly used for outgoing email transport, and it makes use of the TCP port 25. SMTP is used by MTA or the Mail Transfer Agent. Nowadays, SMTP is more widely used for sending emails than receiving them, because POP is used for accessing mail box accounts on an email server (like Internet Message Access Protocol and Lotus Notes). Receiving emails is dependent on the mail/client applications. User-level client mail applications use SMTP for sending out emails to a mail server where it is then relayed. Still, SMTP is not safe from technicalities such as different issues for a lot of present users. One of the problems is the unavailability of a verification service for the sender of the mail. This was not a big problem at the time of its invention; the Internet was used by very few people, usually only those hailing from the academy. Today, though, spam mail is a worldwide phenomenon. Moreover, transfer of different computer viruses is also a prominent issue. Attempts at increasing the security of the SMTP have been made, although they are still not very effective. Another issue is that SMTP is also dependent on the network/ISP settings. Additionally, if the message is not delivered, it is bounced back to the sender. SMTP also verifies proper configuration before sending a message, and grants permission to the computer attempting to send a message. POP gives a basic, standardized way for people to use their own mailboxes and be able to download messages to their own computers. How? All emails are downloaded to your computer from the mail server; even without an Internet connection, the emails are still accessible. STMP servers also make use of a code for easier identification. A clear example would be configuring Hotmail with Outlook Express to produce the code: smtp.hotmail.com. 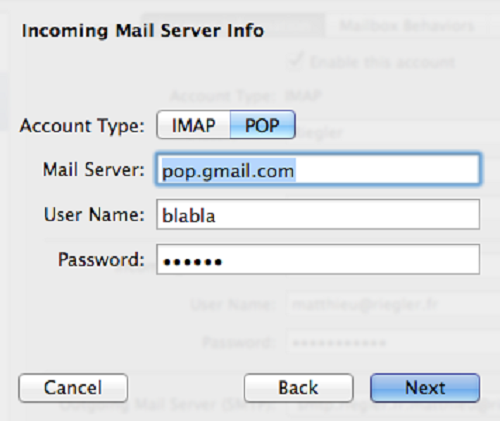 Like the SMTP, POP also needs to be properly configured for an email client, so retrieving messages is permitted. An example of this is mail.hotmail.com, which is POP configured with Outlook Express. Messages stored under POP are stored on the server, and they are then moved to the computer’s hard drive. Fort this reason, having a backup is extremely important so that all retrieved messages are safe. When an email client is configured with both SMTP and POP, a mailbox is available for sending and receiving e-mails with just one central location. This mailbox is also protected by a password. 1.SMTP (Simple Mail Transfer Protocol) and POP (Post Office Protocol) are both standards used for emailing. 2.Simply put, SMTP is used when receiving and sending emails (like your very own mailman who picks up and delivers your mail to different locations), while POP is the protocol used for storing emails (like your very own Post Office Box for mail storage). 3.SMTP is the protocol in general use at the moment. 4.POP gives a basic, standardized way for people to use their own mailboxes and be able to download messages to their own computers. Celine. "Difference Between SMTP and POP." DifferenceBetween.net. May 31, 2018 < http://www.differencebetween.net/technology/internet/difference-between-smtp-and-pop/ >. Here in this line, from your website, you mentioned SMTP is used for both receiving and sending emails. I think SMTP is used for sending emails (from client to email server or email server to another email server) not for receiving emails. Please correct me or your content. sudarshan im studing now at school about it and yes i agree with you the SMTP is used to send emails not receiving emails. The pdf we have it says that. Which port no is used for pop3?